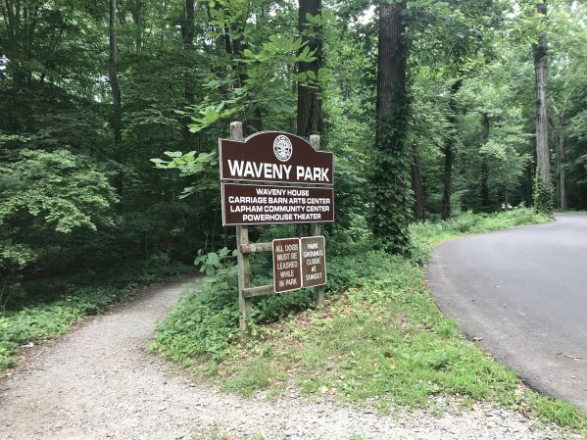 Darien and New Canaan officials, along with some cycling enthusiasts, have been discussing ways of promoting bicycle routes built for two towns, so that cyclists in one town might ride to the other, visiting Waveny Park, for example, or Weed Beach. First Selectman Jayme Stevenson said last week that the state Department of Energy and Environmental Protection (DEEP) has a grant program that could fund a project to put up bike route signs and even pay for publicity and promotional materials to encourage people to bike from one town to the other. “I received last week notice that Connecticut’s DEEP has a recreational trails grant, and our proposed bike path would be eligible for grant-funding dollars to help fund signs and roadway markings and PR [public relations] materials,” Stevenson said Monday, Sept. 10, at the Board of Selectmen meeting. Weed Beach: Should Darien make it easier for two-wheeled New Canaanites to cycle there? “If we should choose to apply for that, they look very favorably on multi-jurisdictional projects, as this one would be,” she said. “And the idea really is to […] sort of document conditions that already exist today. Darien charges people who aren’t residents a high fee to park in the parking lot. Waveny Park and other public New Canaan recreational facilities don’t charge parking fees, although there are a limited number of permits for non-New Canaan residents to use the New Canaan town pool at Waveny. Should New Canaan encourage Darienites to park their bikes in its parks? Like the route to Heaven, Nearwater Lane, the only route to Weed Beach, is both straight and narrow for cyclists, including those from the town calling itself the Next Station to Heaven. 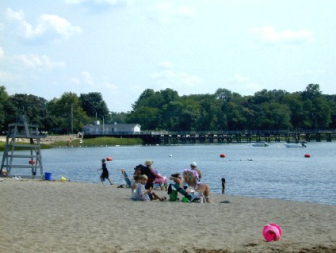 Pear Tree Point Beach is another possibility for roving New Canaanites, a bit farther away. Stevenson mentioned “other facilities” that Darien and New Canaan cyclists might find an interest in visiting in the other town, including downtown stores and restaurants. She didn’t mention other specific places, but each town has nature centers, parks, scenic roads, a movie house, a bookstore and a historical society museum. New Canaan has the Glass House and, at the northern end, Grace Farms. It also has bears, bobcats and sometimes a report or two of mountain lions. Darien has an ice rink, whales off its coast and there are reports of dolphins. It also has jellyfish that can sting you. Always carry raw steak in your bike pack. As you race away from the beast, take it out and wave it just a bit, then fling it in the general direction of the predator as you pedal furiously in the other direction. Darien is also not far from Stamford’s Cove Island Park, a bigger facility with its own paved pathways, a small aquarium and Terry Connors Ice Rink. Cove Island Park is about the same distance from New Canaan that Weed Beach is, and no more difficult to get to. Not far from Cove Island Park in Stamford is the Chelsea Piers sports complex. As we prepare to sing “Auld Lang Syne,” millions around the world are gearing up to celebrate the 260th birthday of the song’s writer, Scottish national poet Robert Burns. On or near Jan.